The artwork and knowledge of eras past is what we draw our inspiration from for our creativity now. Paperblanks imagines this in more of a literal sense with their notebooks inspired by the rich artistic history of human culture. By using meticulous craftsmanship, Paperblanks brings these elements of iconic artists and thinkers into the present through the art of journaling. 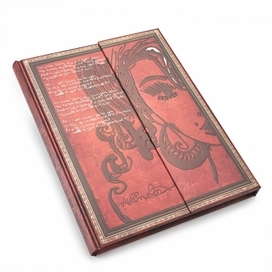 Using artwork inspired by the Gutenberg Bible, ancient Japenese art and even Vintage Vouge, Paperblanks creates beautiful artwork on the outside of their products to inspire your beautiful artwork on the inside. Above all, Paperblanks believes that art matters. They know that their blank books have a critical part to play in the creation of art so they make them perfectly. Innovative design, careful handiwork and conscientious manufacturing practices all go into the creation of every product. Sustainability is also a value that Paperblanks prioritizes by using sustainable forest paper and 100% recycled binding. These notebooks were built tough to hold every shred of your imagination and art, while always inspiring you with a unique writing experience.